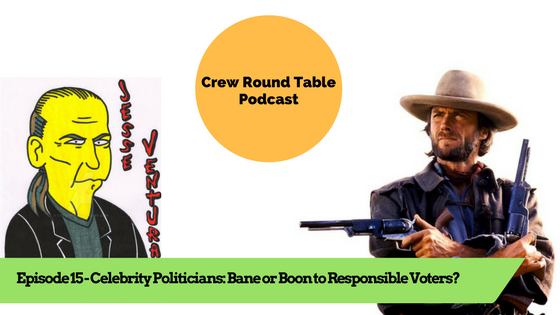 Home Crew Round Table Podcast Episode 16 - Celebrity Politicians: Bane or Boon to Responsible Voters? Episode 16 - Celebrity Politicians: Bane or Boon to Responsible Voters? Is there anything inherently bad about celebrity politicians? The USA has plenty of celebrity politicians, but in Canada… not so much. Kevin O’Leary is looking to change that by becoming the leader of the Federal Conservative Party of Canada. Is he just a slightly more genteel version of Donald Trump for Canada? Celebrity politicians seem to seem to flourish in times of hardship. From time to time the voting public craves a tough-talking celebrity “outsider” who will come in to clean up government. In this show we examine the idea that being an “outsider” is beneficial to celebrity politicians. We ask if governance is a specialized discipline like plumbing or masonry? Does one have to put in time at lower levels, become part of the machine, and build political favours to get anything done in government? What do celebrity politicians do well, can they help generate interest beyond single issue causes, and will Canada follow America’s lead by electing a reality TV millionaire to the highest office in the land? All this and more in another fantastic episode of “Crew Roundtable”! We love doing the show for you, we hope you love listening, and we appreciate you sharing with your friends - THANKS! Episode 15 - NES Classic Edition; NES Classic, Extra Life or Game Over? Introducing our new segment, Quick Fire hosted by JR!! Crew Round Table podcast, the offspring of talent, talk and entertainment.